Pulse aka Kairo (2001) has long been considered one of the key J-Horror films of the last generation, along with Ring (1998) and The Grudge (2002). 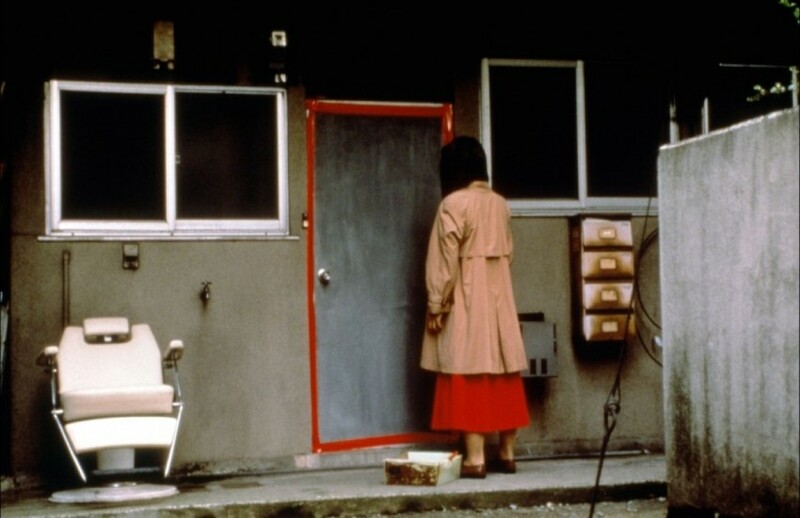 It remains one of the two films for which director Kiyoshi Kurosawa is most highly regarded, along with his earlier Cure (1997). In a fascinating 40-minute interview on Arrow’s new, extras-stuffed release Kurosawa describes Pulse as a rehash of Ring. That observation doesn’t spring immediately to mind. Ring is about a VHS videotape, a death threat by phone and a deadly ghost named Sadako who crawls creepily out of the TV set. Pulse is about internet and mobile phone images before present day smartphones with their image-sending capabilities became commonplace. People seeing these images slowly lose their grip on reality and vanish into thin air by, for example, turning into a stain which then falls off the wall as little particles to be blown away on an air current. You can see how Pulse could be derived from Ring, yet despite undeniable similarities the two films are very different. As slogans on some of Pulse’s TV spots on the disc put it: “Terror overflowing from the Internet”, “Can the Internet dial you up itself?” and “The Pulse of Terror”. As per its internet dial-up reference Pulse very much harks back to the period in which it was made. Small candybar phones couldn’t yet do much beyond connect people to talk or text each other. With no smartphones, the idea of sending an image by phone was a lot more novel than it is now. Desktop computers running the internet on dial-up meant the internet wasn’t permanently connected. This volatile and constantly evolving, brave new world where lots of today’s everyday technology didn’t really exist was ripe for exploring a fear of the unknown. Today, the online world no longer feels brand new and intimidating. In recent years Kurosawa has ventured back into ghost stories and horror with Journey to the Shore (2015) and Creepy (2016) but in neither case have computers or the internet provided a gateway to the material. Moreover, when he made Pulse, the director was convinced the J-Horror craze was about to end and threw every horror idea he had at it. The result is part-horror film and part-art movie. Unlike the more logically structured Ring, we’re never quite sure who or what is in Pulse’s computer and phone images or quite how they pose a threat. Pulse’s finale even throws in an apocalyptic scenario with smoke billowing from skyscrapers and cars with a burning passenger aircraft descending through the skies. It’s never clarified exactly who the attackers might be, but somehow that just adds to the film’s power. The narrative starts and ends on a ship where the captain (Koji Yakusho) calms the traumatised Michi (Kumiko Aso). She relates how the current situation came about. In her flashback her boyfriend Taguchi (Kenji Mizuhashi) fails to come to work after working at home on an impending deadline. When she visits his home to collect a computer disc, he unexpectedly hangs himself. Worse follows when she and her colleagues discover strange images of both Taguchi and an unknown, shadowy face on the disc itself. Co-worker Yabe (Masatoshi Matsuo) receives messages saying “help me” on his mobile. Something nasty lurks behind a door sealed up with red tape, and another colleague, Junko (Kurume Arisaka), inadvertently ventures inside. A parallel plot which makes little sense as part of Michi’s flashback sees student Kawashima (Haruhiko Kato) run into similarly spooky online phenomena when he signs up to the internet. Soon he’s seeking advice from post-grad computer student Harue Karasawa (Koyuki) who after offering obvious, basic technical admonitions, starts consulting books on phantoms in the college library. Several suicides and disappearances later, their plot collides with Michi’s when Kawashima finds her slumped exhausted at the wheel of her car near the factory premises where much of the final reel takes place. All this makes for compelling viewing, although Pulse won’t win any awards for narrative coherence. Nevertheless Kurosawa’s working methods deliver a film that exerts a grip on the audience throughout. Cue the disc’s informative Making Of… documentary detailing the director’s working methods, notably his approach to shooting. Multiple rehearsals of Kato/Kawashima interrupting Koyuki/Harue’s attempt at hacking up a group of potted plants prove particularly illuminating. In successive takes, you can see Kurosawa adjusting the scene via specific instructions to his two actors. It’s not that he knows exactly what he wants when he starts shooting, it’s more that he slowly works his way towards a final take, intending to add it to a larger whole even if at the time he’s not entirely sure what that larger whole might be. Just as Pulse explores of the mental disintegration of a number of its characters, here you can see Kurosawa plumbing this process in successive takes with Koyuki/Harue. His methodology is one reason the film has stood the test of time. It’s good to see this aspect of his work laid bare in Arrow’s excellent disc, which also includes among other things a 25-minute interview with cinematographer Junichiro Hayashi and a video appreciation by the director and the writer of Blair Witch (2016). Pulse is released on Dual Format Blu-ray and DVD on 10th July 2017. This is a rare case of me preferring the US adaptation because, frankly, it was a lot more coherent.